Utterly Charming (Sleeping Beauty’s Prince Charming), Zebra Books, 2000. Reissued by Sourcebooks, October, 2011. Available now in ebook as part of The Charming Trilogy, Vol. 1 omnibus, WMG Publishing, March, 2019. Thoroughly Kissed (Sleeping Beauty’s Real Prince Charming), Zebra Books, 2001. Reissued by Sourcebooks, June, 2012. Available now in ebook as part of The Charming Trilogy, Vol. 1 omnibus, WMG Publishing, March, 2019. Completely Smitten, Zebra Books, 2002. Reissued in ebook, audiobook, and trade paperback by WMG Publishing, February, 2011. Available now in ebook as part of The Charming Trilogy, Vol. 1 omnibus, WMG Publishing, March, 2019. Click here to read an excerpt. Simply Irresistible (Book One of the Fates Trilogy), Zebra Books, 2003. Reissued in ebook, audiobook, and trade paperback by WMG Publishing, March, 2011. Available now in ebook as part of The Fates Trilogy omnibus, WMG Publishing, April, 2019. Click here to read an excerpt. Absolutely Captivated (Book Two of the Fates Trilogy), Zebra Books, 2004. Reissued in ebook, audiobook, and trade paperback by WMG Publishing, 2012. Available now in ebook as part of The Fates Trilogy omnibus, WMG Publishing, April, 2019. Totally Spellbound (Book Three of the Fates Trilogy), Zebra Books, 2005. Reissued in ebook, audiobook, and trade paperback by WMG Publishing, 2012. Available now in ebook as part of The Fates Trilogy omnibus, WMG Publishing, April, 2019. Tiffany Tumbles (Book One of the Daughters of Zeus Trilogy). Available in ebook and trade paperback, WMG Publishing, August, 2015. Coming soon in ebook as part of The Daughters of Zeus Trilogy omnibus, WMG Publishing, May, 2019. Crystal Caves (Book Two of the Daughters of Zeus Trilogy). Available in ebook and trade paperback, WMG Publishing, September, 2015. Coming soon in ebook as part of The Daughters of Zeus Trilogy omnibus, WMG Publishing, May, 2019. Brittany Bends (Book Three of the Daughters of Zeus Trilogy). Available in ebook and trade paperback, WMG Publishing, October, 2015. Coming soon in ebook as part of The Daughters of Zeus Trilogy omnibus, WMG Publishing, May, 2019. Wickedly Charming (Cinderella’s Prince Charming), Sourcebooks, May 2011. Coming soon in ebook as part of The Charming Trilogy, Vol. 2 omnibus, WMG Publishing, June, 2019. Click here to read an excerpt. Charming Blue (No One’s Prince Charming), Sourcebooks, September, 2012. Coming soon in ebook as part of The Charming Trilogy, Vol. 2 omnibus, WMG Publishing, June, 2019. 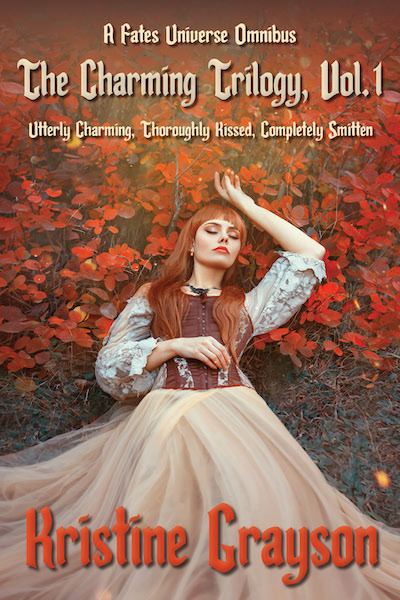 Hidden Charm (Sleeping Beauty’s Prince Charming), Coming June 2019 in ebook and trade paperback, WMG Publishing, June, 2019. Coming soon in ebook as part of The Charming Trilogy, Vol. 2 omnibus, WMG Publishing, June, 2019. “Standing up for Grace: An Imperia Encanto Adventure,” which tells what really happened at school during Wickedly Charming. Available in ebook, audiobook, and trade paperback, WMG Publishing, August 2011. “The Charming Way,” the story that inspired Wickedly Charming. Ebook edition from WMG Publishing, 2010. Also available in ebook, audiobook, and trade paperback as part of the collection Geek Romance, WMG Publishing, 2011. “The Strangeness of the Day,” the story that inspired Utterly Charming (published under the name Kristine Kathryn Rusch), first published in Battle Magic, edited by Martin H. Greenberg and Larry Segriff, DAW, October 1998. Reprinted in Recovering Apollo 8 and Other Stories, Golden Gryphon, 2010. Reissued in ebook by WMG Publishing, 2010. Up on the Rooftop. Available in ebook and trade paperback, WMG Publishing, January, 2012. Available in ebook as part of The Santa Series omnibus, WMG Publishing, 2015. Visions of Sugar Plums. Available in ebook and trade paperback, WMG Publishing, September, 2013. Available in ebook as part of The Santa Series omnibus, WMG Publishing, 2015. Dressed in Holiday Style. Available in ebook and trade paperback, WMG Publishing, November, 2014. Available in ebook as part of The Santa Series omnibus, WMG Publishing, 2015. “Knowing Jack,” (The first appearance of Roz), electronic edition from WMG Publishing, 2010. Also available in ebook and print as part of the collection Geek Romance, WMG Publishing, 2011. “Artistic Photographs,” (The second appearance of Roz), electronic edition from WMG Publishing, 2010. Also available in ebook and print as part of the collection Geek Romance, WMG Publishing, 2011. Geek Romance: Stories of Love Amidst the Oddballs, includes the short stories The Charming Way, Artistic Photographs, Geeks Bearing Gifts, Knowing Jack, and Name-Calling, available in ebook, audiobook, and trade paperback, WMG Publishing, 2011. Fiction River: Christmas Ghosts, edited by Kristine Grayson, available in ebook, audiobook, and trade paperback, WMG Publishing, 2013. Fiction River: Summer Sizzles, edited by Kristine Grayson, coming June 2019 in ebook and trade paperback, WMG Publishing.